The Sailors and Marines of the Essex Amphibious Ready Group and 15th Marine Expeditionary Unit entered the 3rd Fleet area of operations this week on their way back to San Diego. The group includes the amphibious assault ship USS Essex, amphibious transport dock USS Anchorage and amphibious dock landing ship USS Rushmore. The ships carry a Marine battalion landing team for ground combat and Marine helicopter, tiltrotor and Harrier jet crews. 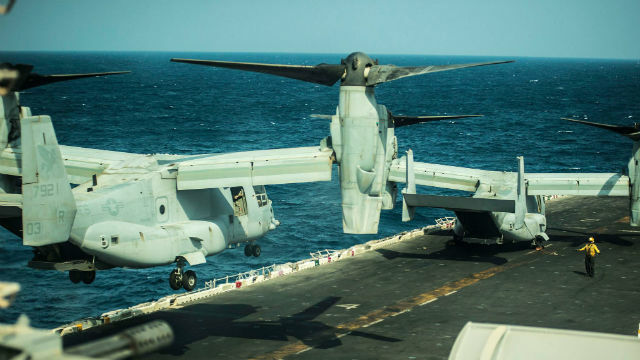 The 4,500 Sailors and Marines left May 11 for a seven-month deployment that included launching airstrikes against ISIS as well as training exercises. “The Essex ARG/15th MEU team was the ‘Swiss Army Knife’ of military capability across a wide range of military operations,” said Navy Capt. Clinton A. Carroll, commander of Amphibious Squadron 3. “The distinct ability of amphibious forces to gain access to critical areas anywhere in the world with ground, air and logistics forces, enables the Navy-Marine Corps team to shape actions across the range of military operations, to resolve conflict, conduct humanitarian assistance, or combat the enemy in remote, austere environments that would otherwise be inaccessible,” said Marine Corps Col. Vance L. Cryer, commander of the 15th MEU.